本发明提供了一种用于改进外部计算设备的性能的自适应存储系统。 The present invention provides a storage system for adaptive performance improvement of the external computing device. 该自适应存储系统包括单个控制器、第一存储器类型(例如，静态随机存取存储器或SRAM)、第二存储器类型(例如，动态随机存取存储器或DRAM)、第三存储器类型(例如，闪存)、内部总线系统以及外部总线接口。 The adaptive controller includes a single storage system, the first type memory (e.g., static random access memory, or SRAM), a second type of memory (e.g., dynamic random access memory or DRAM), a third type of memory (e.g., flash memory ), internal bus system and an external bus interface. 该单个控制器被配置为：(i)使用该内部总线系统与全部三个存储器类型通信；(ii)使用该外部总线接口与外部计算设备通信；以及(iii)将高速缓存数据存储指派分配到第一存储器类型内的存储空间，并且在第一存储器类型内的该存储空间被确定为满的之后，将高速缓存数据存储指派分配到第二存储器类型内的存储空间。 The single controller is configured to: (i) use of the internal bus system in communication with all three types of memory; (ii) using the external bus interface and the external computing devices; and (iii) cache data memory assigned to the assigned storage space in the first memory type, and the memory space in the first memory after the type is determined as full, cache data stored in the allocated memory space assigned to the second memory type. 本申请要求2007年I月10日提交的美国临时申请No. 60/884, 378的优先权。  This application claims the United States on May 10, 2007 I filed a Provisional Application No. 60/884, 378. 背景技术 现代的计算设备通常具有多个且不同类型的内部存储器组件，要求这些存储器组件支持不同的终端应用。  BACKGROUND  Modern computing devices and typically have a plurality of different types of internal memory component, the memory requirements of these components of the terminal support different applications. 这些存储器组件以及它们相关的特征是通过其能够测量计算设备的性能的一些关键度量。 These memory components and their associated key wherein the performance metric computing device which can be measured by. 现代的计算设备通常还能够和通过各种内建的信道（例如PCI总线、火线（Firewire)端ロ、USB端ロ或专门的多媒体卡（MMC)端ロ)添加的存储器组件ー起运行。 Modern computing devices also typically capable of various and built-in channel (e.g. PCI bus, a Firewire (Firewire) end ro, USB or specialized end ro multimedia card (MMC) side ro) from the memory component added ー operation. 所有这些内部的和添加的存储器组件由易失性的或非易失性的存储器或者其某种组合组成。 And adding all of these memory components inside a volatile or nonvolatile memory, or some combination thereof. 与非（Nand)闪存以及或非（Nor)闪存是常见类型的非易失性存储器。 NAND (Nand) and a NOR flash memory (of Nor) Flash memory is a common type of non-volatile memory. 动态随机存取存储器（DRAM)和静态随机存取存储器（SRAM)是易失性存储器类型。 A dynamic random access memory (DRAM) and static random access memory (SRAM) is a volatile memory type. 存储器类型可以根据性能和密度来分类。 The memory type may be classified according to the performance and density. 高性能存储器（例如SRAM)较大，实现起来较费钱，并且消耗较多功率。 High-performance memory (such as SRAM) is large, to implement a more expensive and consume more power. 较高密度的存储器（例如DRAM)较经济合算，但是通常具有较差的由单个元件的存取时间和由带宽测得的性能，或者具有较差的将存储内容传送到要求包含在存储系统中的数据或指令的处理元件的速率。 Higher density memory (e.g., DRAM) more cost-effective, but generally have poor poor store the contents transmitted by the access time of a single element and by the bandwidth of the measured performance, or having to claim contained in the storage system rate data or instruction processing elements. 当将这些现代的存储系统实现在移动设备（例如膝上型PC、蜂窝式电话、PDA或者任何其它各种超便携的个人计算设备）中时，这些相关的权衡尤其关键。  When these modern storage systems implemented in a mobile device (e.g. laptop PC, cellular phone, PDA or any other various ultra-portable personal computing device), these trade-offs associated particularly critical. 在这样的设备中，对功耗和形状因子的额外考虑使最佳地配置和利用存储器资源变得很关键。 In such devices, the power dissipation and the additional factor that the optimal shape and arranged with the memory resources becomes critical. 幸运的是，增大计算机产品集成的级别已经使将多个存储器类型封装到单个完整存储系统封装体中成为可能，这具有显著改进存储器数据传送和相关的处理速度的特性。 Fortunately, increasing the level of integration of computer products has enabled the plurality of memory types into a single package a complete package storage system becomes possible, which have significantly improved properties and associated memory data transfer processing speed. 其中这样的集成封装有用的ー种特定的应用为高速缓冲存储系统。  in which such integrated package useful ー species specific application is the cache memory system. 最新的计算系统具有集成的高速缓存系统，其包含I级和2级SRAM高速缓存。 Latest computing system with integrated cache system, comprising a grade I and 2 SRAM cache. 通常，处理器使用高速缓存来减少从存储器存取类似数据的平均时间。 Typically, the processor uses the cache to reduce the average access time similar data from the memory. SRAM高速缓存是低容量的、快速存储器类型，其存储从主存储单元（memory location)频繁存取的数据的拷贝。 SRAM cache is a low volume, the type of flash memory, which stores copy from the main storage unit (memory location) of frequently accessed data. 当处理器尝试从主存储单元读取或者写入主存储单元吋，它首先检查高速缓冲存储单元来看看先前存储的类似数据的拷贝是否可用。  The copy is available when the processor attempts to read from or written into the main storage unit inches main storage unit, it first checks the cache memory means to look similar to the previously stored data. 处理器通过将数据地址存储单元与高速缓存进行比较来看看是否存在高速缓存命中（数据存在于高速缓存中）来进行检查。 Processor through the data cache and the address storage unit is compared to see if there is a cache hit (data exists in the cache) to be checked. 如果处理器未发现数据在高速缓存中，则出现高速缓存未命中并且处理器必须在慢得多的数据检索速率下运行，因为它需要从更慢的主存储单元（例如硬盘或者闪速存储器即闪存）存取数据。 If the processor is not found in the data cache, a cache miss occurs and data retrieval processor must run at a much slower rate, as it requires from the slower main memory unit (e.g. a hard disk or a flash memory, i.e., flash memory) access data. 以某些方式増大高速缓存命中以便减少对存取最慢存储器类型来发现频繁存取数据的需要，会是有利的。 In some way zo large cache hit in order to reduce the access of the slowest memory types need to find the frequently accessed data would be advantageous. 该发明内容被提供来以简化形式引入概念的选择，将在下面的具体实施方式中进一歩描述所述概念。  This Summary is provided to introduce a selection of concepts in a simplified form, the concept will be described into a ho in the following embodiments. 该发明内容不意图确认所要求保护的主题的关键特征，它也不意图用于在确定所要求保护的主题的范围方面给予帮助。 This Summary is not intended to identify subject matter of the key features, it is not intended to be used for help in determining the scope of the claimed subject matter of respect. 鉴于与如在上面背景技术部分中所讨论的现有技术存储系统相关的低效，本申请的发明人已经发明了自适应存储设备，其使用价格比较低廉的DRAM技术帮助高速缓存扩展，而同时允许在同一个添加的存储系统的存储器组件之间进行直接存储器传送。  In view of the prior art associated with such storage systems in the Background section above discussed inefficient, the inventors of the present application has invented adaptive storage device, using a less expensive DRAM technology to help expand the cache while allowing the components of the storage system between the memory with a memory transfer directly added. 此外，本发明可以有利地并入专门的高速缓存算法以利用扩展的高速缓存和内部存储器存取。 Further, the present invention can be advantageously incorporated into a dedicated cache algorithm using the extended memory and an internal cache access. 根据本发明一个实施例，提供了ー种用于改进外部计算设备的性能的自适应存储系统（adaptive memory system)。  According to an embodiment of the present invention, there is provided an adaptive storage system (adaptive memory system) ー species for improved performance of the external computing device. 该自适应存储系统包括单个控制器、第一存储器类型（例如，静态随机存取存储器或SRAM)、第二存储器类型（例如，动态随机存取存储器或DRAM)、第三存储器类型（例如，闪存）、内部总线系统以及外部总线接ロ。 The adaptive controller includes a single storage system, the first type memory (e.g., static random access memory, or SRAM), a second type of memory (e.g., dynamic random access memory or DRAM), a third type of memory (e.g., flash memory ), internal bus system and an external bus interface ro. 该单个控制器被配置为：(i)使用该内部总线系统与全部三个存储器类型通信；（ii)使用该外部总线接ロ与外部计算设备通信；以及（iii)将高速缓存数据存储指派（assignment)分配到第一存储器类型内的存储空间，并且在第一存储器类型内的该存储空间被确定为满的之后，将高速缓存数据存储指派分配到第二存储器类型内的存储空间。 The single controller is configured to: (i) use of the internal bus system in communication with all three types of memory; (ii) the use of an external bus connected to the external computing ro communication device; and (iii) cache data storage assignment ( assignment) assigned to the storage in the first memory type, and the memory space in the first memory after the type is determined as full, cache data stored in the allocated memory space assigned to the second memory type. 根据本发明的ー个方面，第一和第二存储器类型是不同的易失性存储器类型（例如，SRAM和DRAM)而第三存储器类型是非易失性的类型（例如，闪存），并且该单个控制器还被配置为使第一和第二存储器类型的没有被写入的部分掉电，以使功耗最小化。  According ー aspect of the present invention, the first and second memory types are different types of volatile memory (e.g., SRAM, and DRAM) and the third type is a type of nonvolatile memory (e.g., flash memory), and the single controller is further configured to cause a first portion and a second memory is not written down type, in order to minimize power consumption. 根据本发明的另一方面，该单个控制器还可以被配置为将高速缓存数据从该SRAM或者该闪速存储器传送到该DRAM。  According to another aspect of the present invention, the single controller may also be configured to transmit data from the SRAM cache or the flash memory to the DRAM. 如果该高速缓存数据存在于该SRAM内，则将该高速缓存数据从该SRAM传送到该DRAM。 If the cache data present in the internal SRAM, the cache data is transmitted from the SRAM to the DRAM. 如果该高速缓存数据不存在于该SRAM内，而存在于该闪速存储器内，则将该高速缓存数据从该闪速存储器传送到该DRAM。 If the cache data is not present in the SRAM, but is present in the flash memory, the cache data is transmitted from the flash memory to the DRAM. 根据本发明的另ー实施例，提供了一种用于控制自适应存储系统的方法，其中该自适应存储系统包括单个控制器、第一存储器类型、第二存储器类型、第三存储器类型、内部总线系统以及外部总线接ロ。  According to another embodiment ー embodiment of the present invention, there is provided a method for adaptively controlling the storage system, wherein the storage system comprises a single adaptive controller, a first memory type, a second type of memory, the third memory type, internal bus system and an external bus interface ro. 该方法通常包括三个步骤：（i)使用内部总线系统与全部三个存储器类型通信；（ii)使用该外部总线接ロ与外部计算设备通信；以及（iii)将高速缓存数据存储指派分配到第一存储器类型内的存储空间，并且在第一存储器类型内的存储空间被确定为满的之后，在第二存储器类型的存储空间内分配高速缓存数据存储指派。 The method generally includes three steps: (i) the use of internal bus system in communication with all three types of memory; (ii) using the external bus interface computing ro communicate with an external device; and (iii) assigning to the cache data memory is assigned storage space in the first memory type, and the storage space in the first memory after the type is determined as full, allocate cache data is stored in the second memory type assigned memory space. 根据本发明的又ー实施例，提供了ー种包括计算机可执行程序的计算机可读介质，用于控制自适应存储系统的单个控制器的操作。  According to yet another embodiment ー embodiment of the present invention, there is provided a computer-executable program comprising ー types of computer-readable medium, the controller for controlling operation of a single adaptive storage system. 该自适应存储系统还包括第一存储器类型、第二存储器类型、第三存储器类型、内部总线系统以及外部总线接ロ。 The adaptive storage system further comprises a first memory type, a second memory type, the third type of memory, an internal bus and an external system bus interface ro. 该计算机可执行程序在被执行时使得该单个控制器执行通常包括三个步骤的方法：（i)使用该内部总线系统与全部三个存储器类型通信；（ii)使用该外部总线接ロ与外部计算设备通信；以及(iii)将高速缓存数据存储指派分配到第一存储器类型内的存储空间，并且在第一存储器类型内的存储空间被确定为满的之后，将高速缓存数据存储指派分配到第二存储器类型内的存储空间。 The computer-executable program causing the single controller performs, when executed, a method generally includes three steps: (i) use of the internal bus system in communication with all three types of memory; (ii) using the external bus interface and external ro communication computing devices; and (iii) cache data is stored into the memory space allocated is assigned in the first memory type, and the storage space in the first memory after the type is determined to be full, the cache data memory allocating assigned to a second memory space within the memory type. 根据本发明的还ー实施例，提供了ー种包括计算机可执行程序的计算机可读介质，用于实现自适应存储系统的单个控制器的数据先行高速缓存方案。  According to the present invention further ー embodiment, there is provided a computer-executable program comprising ー types of computer-readable media for data storage of a single controller system first adaptive caching scheme. 该自适应存储系统还包括第一存储器类型、第二存储器类型、第三存储器类型、内部总线系统以及外部总线接ロ。 The adaptive storage system further comprises a first memory type, a second memory type, the third type of memory, an internal bus and an external system bus interface ro. 该计算机可执行程序在被执行时使得该单个控制器执行通常包括四个步骤的方法：(i)从运行在外部计算设备上的应用获得扇区数据的序列；（ii)将所获得的扇区数据的序列与多个先前存储的扇区数据的序列进行比较以确定是否存在高概率匹配；（iii)如果在所获得的扇区数据的序列与该多个先前存储的扇区数据的序列之间确定了高概率匹配，则用所确定的高概率匹配来至少高速缓存第一存储器类型；以及（iv)如果在所获得的扇区数据的序列与该多个先前存储的扇区数据的序列之间没有确定高概率匹配，则确定是否能够从该多个先前存储的扇区数据的序列中选出最可能的扇区数据的序列。 The computer-executable program causing the single controller performs, when executed, a method generally comprises four steps: (i) obtaining sequence data from a sector of an application running on the external computing device; (ii) the obtained fan sequence of the plurality of sector data previously stored area data is compared to determine whether there is a high probability of matching; (iii) if the sequence of the plurality of sectors of data previously stored in the sequence of the obtained sector data determining the probability of match between the high, matching the at least a first cache memory type high probability determined; and (iv) If the plurality of sectors previously stored data in the sequence of the obtained sector data not determined high probability matches between the sequences, it is determined whether the most likely sequence of sector data sequence can be selected from the plurality of sector data previously stored. 根据本发明的ー个方面，如果能够选出最可能的扇区数据的序列，则将所选的最可能的扇区数据的序列高速缓存到第一存储器类型或第二存储器类型中；并且如果不能选出最可能的扇区数据的序列，则启动高速缓存数据训练序列（training sequ ence)。  According to one aspect of the present invention ー, if able to select the most likely sequence of sector data, the most likely sequence of sector data will be selected cache memory to the first memory type or the second type ; and if you can not choose the most likely sequence of sector data, the cache data training sequence (training sequ ence) start. 根据本发明的另一方面，该高速缓存数据训练序列在第一存储器类型或者第二存储器类型内存储所获得的扇区数据的序列，并且在第三存储器类型中存储该序列的非易失性的拷贝。  According to another aspect of the present invention, the sector data cache data memory type training sequence of the first or the second type of storage memory within the obtained sequence, and the sequence stored in the third non-memory type volatile copy of. 根据本发明的再ー实施例，提供了一种用于实现自适应存储系统的单个控制器的数据先行高速缓存方案的方法。  According to a further embodiment of the present invention ー, there is provided a controller for a data of a single storage system adaptive caching scheme preceding methods. 该自适应存储系统包括单个控制器、第一存储器类型、第二存储器类型、第三存储器类型、内部总线系统以及外部总线接ロ。 The adaptive storage system includes a single controller, a first memory type and a second memory type, the third type of memory, an internal bus and an external system bus interface ro. 该方法通常包括四个步骤：（i)从运行在外部计算设备上的应用获得扇区数据的序列；（ii)将所获得的扇区数据的序列与多个先前存储的扇区数据的序列进行比较以确定是否存在高概率匹配；（iii)如果在所获得的扇区数据的序列与该多个先前存储的扇区数据的序列之间确定了高概率匹配，则将所确定的高概率匹配数据至少高速缓存到第一存储器类型；以及（iv)如果在所获得的扇区数据的序列与该多个先前存储的扇区数据的序列之间没有确定高概率匹配，则确定是否能够从该多个先前存储的扇区数据的序列中选出最可能的扇区数据的序列。 Sequence (ii) the sector data and the obtained sequence of a plurality of sector data previously stored; (I) obtaining sequence data from a sector of an application running on the external computing device: The method generally comprises four steps compared to determine whether there is a high probability of matching; (iii) if the sequence obtained in the sector data is determined between the plurality of sequences of sector data previously stored high probability match, then a high probability determined at least matching data cache memory to the first type; and (iv) if the sector data between the sequences of the obtained sequences with the plurality of sector data previously stored high probability no match is determined, it is determined whether the the most likely sequence of data of the selected sector sequence of the plurality of sector data previously stored. 图9是示出了根据本发明一个实施例的、AMS控制器的数据流和相关带宽分配的框图。  FIG. 9 is a block diagram illustrating one embodiment of the present invention, the data flow controller and associated AMS bandwidth allocation based. 本发明涉及自适应存储系统（AMS)，其包含易失性的和非易失性的存储器组件以及控制器组件，该控制器组件被配置为管理存储器组件之间的数据传送和存储器组件与外部计算设备之间的数据传送。  The present invention relates to an adaptive storage system (the AMS), which includes both volatile and nonvolatile memory components and a controller assembly, the controller assembly is configured to transfer data between the memory and the memory management component data transfer between the components and an external computing device. 存储器组件和控制器组件（在此被统称为AMS组件）被具体实现在多芯片封装集成电路（MCP)上，其能够被可配置地设计成可拆装地插入任何传统的个人计算设备（例如台式PC、膝上型PC、蜂窝式电话、PDA或者超移动PC)中。 Memory components and a controller components (herein collectively referred to as assembly AMS) are embodied in an integrated circuit multi-chip package (MCP), which can be designed to be configured to be detachably inserted into any conventional personal computing device (e.g. desktop PC, laptop PC, cellular phone, PDA or ultra mobile PC) in. 本发明还涉及由AMS控制器组件实现的数据传送控制方案，其增强与AMS和外部计算设备之间的数据传送有关的综合性能。 The present invention further relates to a data transfer control program implemented by the AMS controller assembly, which enhances the overall performance associated with the transfer of data between the device and an external computing AMS. 根据ー个实施例，图I中示出的AMS 10包括多个AMS存储器组件类型，该多个AMS存储器组件类型包括：静态随机存取存储器（SRAM) 14、动态随机存取存储器（DRAM) 16以及闪速存储器18。  The 10-ー AMS plurality of memory component types including, for example, AMS shown in Figure I embodiment, the plurality of memory components AMS type comprising: a static random access memory (SRAM) 14, dynamic random access memory ( DRAM) 16 and flash memory 18. 应当理解，本实施例的存储器组件类型仅仅是能够在AMS内运行的存储器类型的实例，而本发明不限于本实施例中使用的确切的存储器类型。 It should be understood that the type of the memory component of the present embodiment are merely examples of the type of memory capable of operating in the AMS, the present invention is not limited to the exact type of memory used in the embodiment. AMS控制器组件（或者简称为“控制器”）12被配置为通过内部总线系统20与SRAM、DRAM和闪速存储器组件通信并且通过外部总线接ロ22与外部计算设备（未示出)通信。 AMS controller component (or simply "controller") 12 is configured to communicate 20 with SRAM, DRAM and the flash memory package through an internal bus system and through the external bus interface 22 ro external computing device (not shown) communication. 该配置允许AMS控制器12完全管理存储器组件之间的数据流，而与外部计算设备无关。 This configuration allows the controller 12 completely AMS manages data flow between the memory component, regardless of an external computing device. 在如图2中所示出的包含类似的存储器组件类型的传统MCP存储设备中，对于闪速存储器数据传送的控制发生在外部计算设备。  MCP conventional storage devices containing similar memory in component types shown in FIG. 2, the control data is transmitted to the flash memory occurs in the external computing device. 例如，当应用在外部计算设备上运行并且要求应用数据在MCP存储设备30的RAM存储器组件32、34与闪速存储器组件36之间传送时（例如，当高速缓存应用页数据时），外部计算设备40的处理器使用集成的闪存控制器42控制闪存数据的传送。 For example, when an application running on the external computing device and requires the application data is transferred between the storage device 36 MCP RAM 30 memory component 32, 34 of the flash memory component (e.g., when the application page data cache), an external computing the processor device 40 using the integrated flash controller 42 controls flash memory data transfer. 在该系统中，可传送的闪存数据必须由外部计算设备的处理器40从MCP存储设备的闪速存储器组件36路由穿过闪存接ロ39和外部的闪存总线46、并且往回穿过RAM双倍数据率（DDR)总线48和RAM接ロ38到达MCP存储设备的RAM存储器组件32、34。 In this system, a flash memory data may be transmitted by the processor 40 from the external computing device 36 through a flash the flash memory package MCP route from the storage device 39, and a flash contact ro external bus 46, and back through the RAM bis data rate (DDR) bus 48 and a RAM 38 to RAM memory access ro MCP assembly 32, 34 of the storage device. 该数据路由方案对于在非易失性存储器组件（例如，闪存）和同一MCP存储设备上的易失性存储器组件（例如，RAM)之间传送（高速缓存）数据是低效的。 The data routing scheme is inefficient for data in the nonvolatile memory component (e.g., flash memory) volatile memory component on the same MCP and storage devices (e.g., the RAM) transmission between a (cache). 例如如图I中所示出的，根据本发明各个实施例的AMS MCP技术通过帮助AMS闪存（18)和RAM(14、16)存储器组件之间的直接存储器存取（DMA)而不需要使用外部计算设备的处理器来解决该低效的问题。  The example shown in FIG. I in accordance with various embodiments AMS embodiment of the present invention, MCP techniques (14, 16) between the memory component direct memory access (DMA) by helping AMS flash (18) and a RAM the processor does not require an external computing device to solve the problem of the inefficient. 本发明的电路上的（on-circuit)AMS控制器12控制闪速存储器组件18和RAM存储器组件14、16之间的数据传送，使得能够通过内部总线系统20将闪存数据直接传送到期望的RAM存储器组件位置14、16。 (On-circuit) AMS circuit of the present invention on the controller 12 controls the flash memory package assembly 18 and a RAM memory 14, the data transfer between, the flash memory 20 enables the data transfer via the internal bus system RAM directly into the desired 14, the position memory component. 由于该DMA数据传送控制方案不需要使用外部计算设备的处理器，因此它有效地減少了外部总线带宽的使用，其中该外部总线是在AMS和外部计算设备之间的总线。 Since the DMA data transfer control program does not require an external computing device using a processor, and therefore it is effective in reducing the use of external bus bandwidth, wherein the external bus is a bus between the AMS and the external computing device. 根据本发明的各个实施例，以这种方式，能够优化外部总线带宽以允许外部计算设备的处理器用高得多的速率从AMS存储器组件读取数据以及将数据写到AMS存储器组件。 According to various embodiments of the present invention, in this way, it is possible to optimize the external bus bandwidth external computing device to allow the processor to read data from the memory component AMS with a much higher rate and write data to the memory component AMS. 此外，在AMS闪速存储器组件18和AMS RAM存储器组件14、16之间更短的物理DMA互连提供了与上面讨论的传统传送方案相比更低的寄生电容。 Further, between the flash memory package 18 and AMS AMS shorter the RAM memory components 14, 16 provide physical interconnect DMA lower as compared with the conventional transmission scheme discussed above, the parasitic capacitance. 已知电路中过大的寄生电容会减少带宽、提高外来干扰的可能性并且增大在正常电路操作条件期间的功耗。 In the known circuit the parasitic capacitance is too large reduce the bandwidth and improve the possibility of external interference and increases the power consumption during normal circuit operating conditions. 当在这些AMS存储器组件之间反复地传送数据时（例如，当高速缓存页数据时），在本发明中实现的更短的导线长度数据传送提供了显著的节电量。 When data is transferred repeatedly between the AMS memory components (e.g., when the page data cache), shorter wire length data transmission implemented in the present invention provides significant power savings. 消除外部计算设备的处理器对AMS存储器组件数据传送控制的影响的另一个优点在于在装载之前实际的文件管理功能被嵌入在AMS内。 Another advantage of the  processor to eliminate the influence of an external computing device memory component AMS data transfer control that is loaded before the actual file management function is embedded in the AMS. 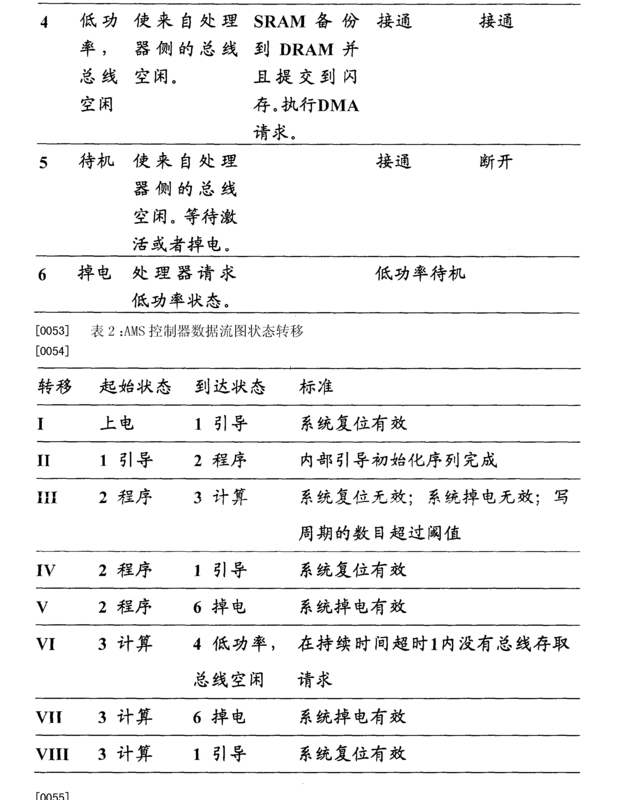 这允许外部计算设备将AMS看作标准文件系统。 This allows the external computing device AMS will be treated as a standard file system. 标准文件系统能够由标准操作系统级驱动器来支持，由此消除了在操作系统级维持专门的依赖闪存的设备驱动器的需要。 Standard file system can be supported by the standard operating system level drivers, thereby eliminating maintained at the operating system level specialized rely flash device driver needs. AMS的自含的（self-contained)闪存驱动器软件被包含在附图中示出的AMS文件系统分区50的嵌入式SRAM/DRAM/闪存可安装文件系统分区54内。 AMS AMS file system partition of a self-contained (self-contained) flash drive is included in the software illustrated in the figures in the embedded SRAM 50 / DRAM / Flash memory 54 installed within the file system partition. 在所示出的实施例中，其它AMS文件系统分区包括标准的FAT文件系统分区52以及包括引导（Boot)分区和闪存接口数据的设备配置分区56。 In the illustrated embodiment, other file system partition comprises AMS standard FAT file system partition, and includes a guide 52 (the Boot) partitions that device configuration data 56 and a flash interface. 嵌入式闪存驱动器软件不需要在与操作系统集成的时候进行附加的测试。 Embedded flash drive software does not require additional testing when integrated with the operating system. 该独立的存储器驱动器控制有利地允许几乎任何操作系统认出AMS，而不需要在外部计算设备上额外地安装专门的存储器驱动器软件。 The separate memory driver control advantageously allows virtually any operating system recognizes AMS, without the need for additional memory to install special driver software on the external computing device. AMS控制器12还可以被配置为通过选择性地选通（gate)到AMSSRAi^P DRAM易失性存储器组件14、16的部分的功率流来使功耗最小化。  AMS controller 12 may also be configured to selectively gate (Gate) to the power flow ^ P volatile DRAM portion 14, 16 AMSSRAi memory components to minimize power consumption. 这样的节电技术是优选的，因为如本领域中众所周知的，SRAM和DRAM易失性存储器类型都需要恒定的功率汲取(power-draw)来维持或者刷新保存在它们的各个存储区的部分内的现有数据。 Such a power-saving techniques are preferred, since, as is well known in the art, SRAM, and DRAM volatile memory type requires a constant power draw (power-draw) is maintained or stored in the refresh memory areas within their respective portions the existing data. 为了使AMS中的该功率汲取最小化，在本发明的各个示例性实施例中，控制器12监视RAM存储器组件以检测何时SRAM或者DRAM 14、16的部分没有被安排被写入并且已经不保存数据。 AMS in order to make the power draw is minimized, in various exemplary embodiments of the present invention, the controller 12 monitors the assembly to detect when the RAM memory SRAM or DRAM portion 14, 16 is not scheduled to be written and has not save data. 一旦检测到RAM的不活动的部分，控制器12就使SRAM或DRAM 14、16的那些不活动的部分掉电以将功率损耗最小化。 Upon detecting the inactive portion of RAM, controller 12 so that those portions inactive SRAM or DRAM 14,16 is powered down to minimize power losses. 以这种方式，能够从AMS设备内部动态地调节功耗，而不需要来自外部计算设备的处理器的任何输入。 In this manner, it is possible to dynamically adjust the power from the internal AMS device, without requiring any input from the external processor of a computing device. 根据本发明的各个示例性实施例，AMS(例如图I中所看到的）被配置为用作高速自适应的高速缓存，其中SRAM 14的部分用作I级和2级高速缓存分区，并且DRAM 16的部分用作3级高速缓存分区。  According to various exemplary embodiments of the present invention, the AMS (e.g. as seen in FIG. I) is configured as a fast, adaptive cache SRAM portion which serves as grade I and 2 of the cache 14 partition, and a portion of the DRAM 16 used as a level 3 cache partitions. 高速的高速缓存能够与外部计算设备的已有高速缓存系统结合起来操作，以自适应地增强该组合系统的数据存储和检索。 Capable of high-speed cache has a cache system with external computing device combined operation to adaptively enhance the combination data storage and retrieval system. 优选地将AMS集成的高速缓存用于与下面操作有关的数据传送和数据存储，该操作与引导代码镜像（Boot CodeMirror)、程序数据、程序代码和应用数据相关。 Preferably the AMS integrated cache for data transfer and data associated with the underlying store operation, the operation code image guide (Boot CodeMirror), program data, program code and data related to the application. 根据配置设定和所需的性能度量来动态地分配用于这样功能的高速缓存的大小和级别。 The configuration settings and performance metrics required to dynamically allocated for such functions and levels of cache size. 将引导代码从闪存18复制到SRAM高速缓存14以快速地初始化设备处理器。  The boot code is copied from the flash memory 18 to the SRAM cache 14 to quickly initialize the device processor. 这表示SRAM高速缓存14的初始使用。 This means that the initial use of SRAM cache 14. 附加的程序代码被识别为从闪存18请求的数据。 Additional program code is identified as 18 requests data from the flash memory. 根据所分配的高速缓存大小和可用性，可以将该附加的程序代码复制到SRAM或者DRAM高速缓存14、16。 The cache size distribution, and availability, can copy the additional program code to SRAM or DRAM cache 14,16. 优选地，在填充DRAM高速缓存16之前填充SRAM高速缓存14，因为由于需要不断地刷新DRAM数据而导致使用DRAM高速缓存比SRAM高速缓存消耗更多的功率。 Preferably, in the SRAM cache fill filling DRAM cache 14 until 16, because due to the need to constantly refresh the DRAM data cache results in a DRAM consumes more power than SRAM cache. 图4示出了根据本发明一个实施例的、在AMS存储器组件和AMS控制器60之间的数据传送。  FIG 4 illustrates an embodiment of the present invention, data transfer between the memory component and AMS AMS controller 60. 在该图示中，闪存数据的分立的块被称为“页”。 In this illustration, a separate flash data block is called a "page." 初始将这些数据页从闪存80传送到SRAM 62，如路径Pl所示出的。 These initial page transfer data from the flash memory 80 to SRAM 62, as shown in path Pl. 然后将该页集中在一起并且经由路径P2高速缓存，以生成一块引导代码数据64，然后该引导代码数据64经由路径P3传送到控制器60。 Together and then the page cache via path P2, to generate a boot code data 64, and the guide code data P3 to the controller 64 via path 60. 作为初始化序列或者引导的部分，控制器60将配置DRAM高速缓存72以允许包括DRAM存取的正常操作。 As part of the initialization sequence, or guide, the controller 60 will be configured to allow the DRAM cache 72 comprises a normal operation of DRAM access. 然后控制器60使用经由路径P5从SRAM高速缓存62传送的程序代码66来工作，该程序代码66经由路径P4从SRAM数据页高速缓存，最初从闪存80经由路径Pl发送该SRAM数据页。 The controller 60 uses P5 program codes transmitted from the SRAM cache 62 via path 66 to operate, the program code 66 via path P4 from the SRAM cache data page, the first page sends the SRAM data from the flash memory 80 via path Pl. 当超过了SRAM高速缓存62的有限的容量时，将要求被高速缓存的代码的附加页从SRAM高速缓存62经由路径P6传送到DRAM高速缓存72，或者如果SRAM高速缓存62被确定为满的并且附加页已经不存在于SRAM高速缓存62中，则将它们直接从闪存80经由路径P7传送到DRAM 72。 When exceeding the limited capacity of the SRAM cache 62, will be required to be additional pages cached code P6 transferred from the SRAM cache 62 via path to the DRAM cache 72, or if the SRAM cache 62 is determined to be full and additional page does not exist in the SRAM cache 62, they are transferred directly from the flash P7 via a path 80 to the DRAM 72. 控制器60 然后能够执行存储在DRAM高速缓存72中的、经由路径P12存取的程序代码74。 The controller 60 is then able to perform in the DRAM cache memory 72, the program code 74 via the access path P12. 程序和应用数据从内部总线系统20(参见图I)内部填充AMS存储空间。  Application programs and data from the memory space filling AMS (see FIG. I) Internal internal bus system 20. 如图4中所示出的，控制器60可以使用路径P10、P11、P14和P13存取SRAM 62或者DRAM高速缓存72中的应用数据或者程序数据的块68、70、76和78。 As shown in FIG. 4 out, the controller 60 may use the path P10, P11, P14 and P13 access SRAM 62 or DRAM cache block 68,70,76 or application data 72 and program data 78. 为了将应用数据提交到闪存80中，必须首先将一页或者多页信息在SRAM 62或者DRAM高速缓存72中集合。 To submit the application data to the flash memory 80 must first be one or a plurality of pages of information in the SRAM 62 or DRAM cache set 72. 当内容已经被确认时，控制器60指示该页或者多页要被“提交”到闪存80。 When content has been confirmed, the controller 60 indicates the page or multiple pages to be "submit" to the flash memory 80. 这由路径P15 “提交”并且由路径P16 “提交”来指示。 This "Submit" by the path P15 and the "Submit" is indicated by the path P16. 然后使用路径Pl将所提交的页写到闪存80。 Then use the path Pl page submitted 80 written to flash memory. 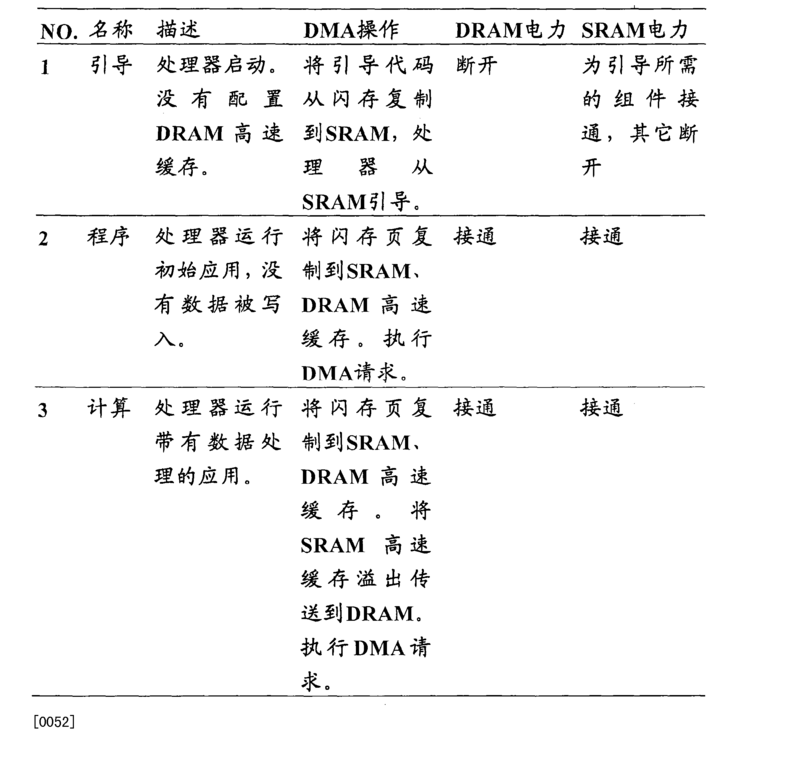 控制器60还可以请求在SRAM和DRAM块68、76之间传送应用数据。 The controller 60 can also request application data transfer between SRAM and DRAM block 68, 76. 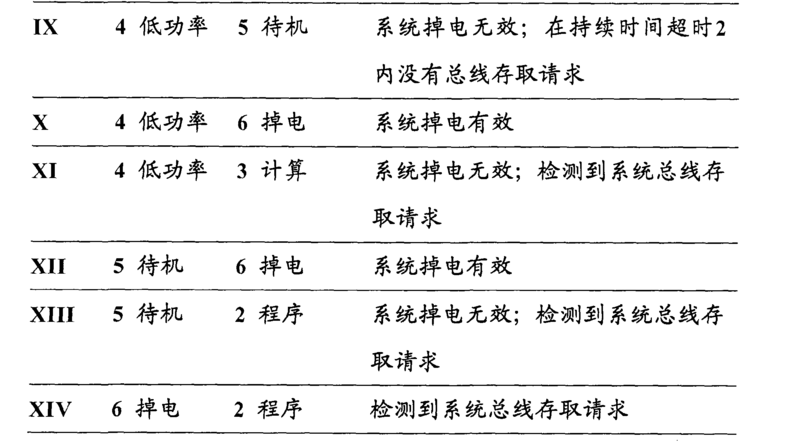 一旦要求，就如路径P8和P9所指出的安排和执行传送。 Once required, as indicated path P8, and P9 arrangements and performs transmission. I、动态地分配致力于高速缓存页数据的SRAM和DRAM的部分，并且基于存储在闪速存储器中的启发式的（heuristics)、预配置的设定和历史的存储器存取信息来调节这样的分配。  I, dynamically allocated dedicated portion of the DRAM and SRAM data cache pages, based on heuristics stored in the flash memory (Heuristics), pre-configured settings and the history information memory access adjusting such allocation. 分配请求包括来自处理器的读取和写入数据到AMS存储器组件的请求以及DMA传送请求。 Allocation request comprises a read and write data from the processor to the DMA transfer request and the requesting AMS memory component. 在图5以及相关表格（下面的表I和表2)中示出了存储器分配算法的实现方式。 (Tables I and 2 below Table) shown in FIG. 5 and the related forms of the implementation of the memory allocation algorithm. 2、使用图6-8中示出的数据先行方案，用从其它存储块镜象的数据填充SRAM和DRAM高速缓存的部分。 Data of the previous embodiment  2, shown in FIG. 6-8, with the mirror data from the other memory blocks filled cache SRAM and DRAM portion. 该数据分配使用可调节的数据总线宽度并且以被确定为使功耗最小化的速率发生。 The data distribution using adjustable width and data bus is determined to minimize power consumption rate occurs. 3、使没有被写入并且被确定没有在使用中的易失性SRAM和DRAM高速缓存的部分掉电。  3, so that no part is determined to be written down and not in use volatile SRAM and DRAM cache. 起初，将这些存储器组件标记为没有被写入，并且存储器的每个部分仅仅根据高速缓存数据的需要而被上电。 Initially, these memory components marked as not being written, and each portion of the memory is only necessary to cache data and is powered on. 图5以状态机形式示出了AMS控制器数据流的图。  FIG. 5 illustrates a state machine in the form of a data flow controller AMS FIG. 表I列出了对应的状态定义而表2列出了与数据流图相关的对应状态转移。 Table I lists the corresponding state while Table 2 lists the definitions associated with the data flow diagram corresponding to the state transition. AMS控制器数据先行高速缓存方案被设计成预期什么特定的数据请求将由外部计算设备的处理器启动。  AMS first controller data caching scheme is designed to what to expect certain data by the requesting processor starts an external computing device. 能够将与所预期的数据请求有关的特定代码或者数据预载到高速存储器设备中（即，被高速缓存）以使它能够在处理器请求类似的代码或数据时被快速地检索。 It can be expected to request data relating to a specific code or data to the high speed memory device preloaded (i.e., cached) to the time that it is possible to quickly retrieve the requested code or data in similar processor. 图6示出了用扇区数据的序列填充AMS SRAM和DRAM高速缓存14、16的部分的该数据先行方案的运行。  FIG. 6 shows the operation of the data portion of the program preceding the filling AMS SRAM and DRAM cache data in the sequence of sectors 14 and 16. 数据的扇区是操作系统可寻址的数据的最小的块，其通常为大约512字节。 Data sector is the smallest addressable block of the operating system data, which is typically about 512 bytes. 扇区数据的序列93是以其长度为特征的、扇区数据的任意有序的集合。 93 sector data sequence is characterized by its length, arbitrary ordered set of sector data. 本发明的先行高速缓存方案有利地允许I级和2级SRAM高速缓存14的部分以及3级DRAM高速缓存16的部分被用高速缓存数据的预测的序列预加载，所述预测的序列通过在下面将描述的块96,102中将历史的高速缓存数据与运行时的（run-time)应用数据进行比较来选择性地确定。 Ahead caching of the present invention advantageously allows the Class I and Class 2 SRAM cache and Level 3 DRAM 14 portion of the cache section 16 is preloaded with the cache data sequence predicted, the sequence predicted by the following the (run-time) history of the application data blocks 96, 102 described in the cache data and comparing the runtime selectively determined. 当在外部计算设备上运行应用时（如在块90、92中），将所获得的应用扇区数据的序列93与先前存储的扇区数据的序列中的每一个相比较（如在块94、96中），以在块98中确定是否能够发现高概率匹配。  When the application running on the external computing device (e.g. at block 90, 92), the sector data with the previously stored application sequences 93 sectors of data obtained in comparing each (e.g. in block 94, 96), in block 98 to determine whether a match can be found with high probability. 以下将详细描述高概率匹配的发现。 High probability of finding matching described in detail below. 如果对于每个存储的序列比较地确定（在块98处为“是”）这样的高概率匹配，则将先前存储的序列匹配标记为高概率匹配并且在块104中根据优选的SRAM高速缓存是否已经被填满而预加载到SRAM或DRAM高速缓存中。 If the comparison is determined (at block 98 "YES"), such a high probability of matching sequence matches the previously stored tag will match and whether the probability is high according to a preferred SRAM cache in block 104 for each stored sequence It has been filled and pre-loaded into SRAM or DRAM cache. 这样的高概率匹配的确定基于高概率阈值（或者高概率匹配（HPM)值），拿该高概率阈值和在所获得的应用扇区数据的特定序列93与如块94、100中的每个先前存储的扇区数据的序列之间所确定的差值来进行比较。 Such a high probability of matching is determined based on the high probability threshold (or a high probability of matching (HPM)), a particular sequence of 93 to take the high probability threshold in the sector and the application data obtained as each of the blocks 94, 100 between the sequences previously determined sector data stored difference for comparison. 在一个实施例中，高概率阈值涉及在所获得的应用序列与先前存储的序列之间的匹配序列扇区的百分比值（即，90-95%)。 In one embodiment, the high probability threshold in the application relates to the previous sequence obtained percentage value matching sequence stored in the sector between the sequences (i.e., 90-95%). 在这样的实施例中，所确定的差值也会涉及百分比值以方便按百分比来进行比较。 In such an embodiment, the determined difference is also directed to facilitate the percentage value compared to a percentage. 如果对于任何先前存储的扇区数据的序列而言所确定的差值小于高概率阈值，并且还小于任何其它先前存储的扇区数据的序列与所获得的应用扇区数据的相同序列的所确定差值（在块98处为“是”），则该先前存储的扇区数据的序列被确定为与所获得的应用扇区数据的特定序列93相关的高概率匹配。 If the sector data for the sequence of any of the previously stored terms of the determined difference is less than the threshold value of high probability, and is also smaller than the sector sequence obtained by the same application sequence data to any other sector data previously stored determined difference (at block 98 is "yes"), the sequence of the sector data previously stored high probability is determined for a particular application the sector sequence of the obtained data 93 matches. 然而，如果由于先前存储的扇区数据的序列中没有一个序列的所确定差值低于高概率阈值而不能确定高概率匹配（在块98处为“否”），则在块102中，最低的所确定差值与更低精度的最可能的序列阈值（或者最可能的序列匹配（MLSM)值）相比较。  However, since the sequence if the sector data is not previously stored in a sequence determined difference is below a threshold value of high probability and high probability match can not be determined (at block 98 "NO"), then at block 102 , the difference between the lowest and the less accurate the most likely sequence determined threshold (or the most likely sequence matching (MLSM) value) is compared. 在一个实施例中，最可能的序列阈值也涉及在所获得的应用序列与先前存储的序列之间的匹配序列扇区的百分比值（即，70-75% )。 In one embodiment, the threshold value of the most likely sequence in the application also relates to the previous sequence obtained percentage value matching sequence stored in the sector between the sequences (i.e., 70-75%). 在这样的实施例中，所确定的差值也会涉及百分比值以方便按百分比来进行比较。 In such an embodiment, the determined difference is also directed to facilitate the percentage value compared to a percentage. 当最低的所确定差值测得为高于高概率阈值但是低于最可能的序列阈值（在块98处为“否”而在块102处为“是”）时，那么该先前存储的扇区数据的序列被确定为与所获得的应用扇区数据的特定序列相关的最可能的序列匹配。 When the lowest fan was measured to determine the difference is above the high threshold but lower than the probability of the most likely sequence of a threshold (at block 98 is "No" at block 102 is "Yes"), then the previously stored sequence regions most likely data sequence is determined to match the specific application sector sequence obtained related data. 在该情况下，当最可能的序列匹配被确定时（在块102处为“是”），将相关的先前存储的序列匹配标记为最可能的序列匹配并且在块104中根据优选的SRAM高速缓存14是否已经被填满而预加载到SRAM或DRAM高速缓存中。 In this case, when the most likely sequence matches is determined (102 at block "Yes"), the relevant previous sequence matching tag matches a stored most likely sequence and, in block 104 according to a preferred SRAM high speed whether the cache 14 has been filled and pre-loaded into SRAM or DRAM cache. 对于更低精度的最可能的序列匹配，还可以标记序列用于重新调整，如下面将参考图8详细描述的。  For the most likely sequence matches a lower accuracy, it can also be used to re-adjust the marker sequence, as will be described in detail with reference to FIG. 对重新调整的需要由其中序列被识别为最可能序列匹配的重复情形具体地指出，因为这些序列更可能需要调整调节（即，扇区数据的重新排序）。 The need for re-adjusted by the repeated wherein the sequence is identified as the most likely scenario is particularly pointed out sequence matching, since these sequences are more likely to require adjustment lever (i.e., reordered sector data). 如果由于先前存储的扇区数据的序列中没有一个序列的所确定差值低于最可能的序列阈值而不能确定最可能的序列匹配（在块102处为“否”)，则在块106中AMS控制器12基于错误确定的可能性来确定是否应该存储应用扇区数据的特定的所获得的序列。  Since the sequence if the sector data is not previously stored in a sequence determined difference is below the threshold value the most likely sequence can not determine the most likely sequence matching (at block 102 is "No"), then AMS block 106, the controller 12 determines whether a particular sequence should be obtained sector data storage applications based on the possibility of erroneous determination. 如果在块106处为“否”，则执行再测试比较。 If "NO" at block 106, then a test is performed to compare. 如果在块106处为“是”，则应该通过启动高速缓存训练序列来将应用扇区数据的特定的所获得的序列预加载到高速缓存中，如下面将参考图7详细描述的。 If at block 106 is "Yes", the particular sequence should be obtained by the training sequence starts with a cache sector data to the application preloaded into the cache, as will be described in detail with reference to FIG. 图7示出了用扇区数据的特定序列113填充AMS SRAM和DRAM高速缓存14、16的部分的AMS控制器高速缓存数据先行训练序列的运行，该扇区数据的特定序列113从运行在外部计算设备上的应用获得，如在块110、112中。  FIG. 7 shows the operation of the first training sequence AMS particular sequence controller section 113 by sector data AMS filling the SRAM and DRAM cache 14, data cache, a particular sequence of the sector data 113 from an application running on the external computing device is obtained, as in block 110, 112. 在应用扇区数据的序列完成加载、超时或者超过预定的大小限制（如块114中所示的）之后，训练序列进行到序列数据简化块118，并且随后在块120中对于先前记录的扇区数据的序列116、122将数据存储高速缓存。 After the completion of the application in the sector data loading sequence, a timeout limit or exceeds a predetermined size (e.g., as shown in block 114), the sequence goes to the training sequence data reduction block 118, in block 120 and subsequently to the previously recorded sector 116, 122 stores the data sequence data cache. 在到易失性的SRAM 14或DRAM 16高速缓存的序列数据存储120时，AMS控制器还将指定用于高速缓存指派的一份序列数据发送到作为备份数据存储设备的非易失性闪存。 In the volatile SRAM 14 or DRAM 16 to cache data sequence is stored 120, AMS control will also specify a sequence for transmitting data cache assigned to the nonvolatile flash memory as the backup data storage device. 在块118中通过用由扇区数据的有序的范围（range)组成的序列取代无序的扇区数据的序列来执行数据简化（data reduction)。 In block 118 with ordered range (range) from the sector data composed of a sequence by random substitution sector data sequence to perform data reduction (data reduction). 该简化产生更有效率的高速缓冲存储和检索机制。 The simplify generating a cache memory retrieval mechanisms and more efficient. 图8示出了用于调整AMS SRAM和DRAM高速缓存14、16的部分的AMS控制器高速缓存数据先行调整序列的运行，使得存储的扇区数据的已有序列136与应用扇区数据的所获得的序列127相比较，如在块124、126、128和130中。  FIG. 8 shows the SRAM and DRAM for adjusting AMS AMS cache data portion of the cache controller 14 and 16 to adjust the first operating sequence, so that the sector data have been stored in the sector sequence 136 and Application sequence comparison of the obtained data 127, as shown at block 124, 126 and 130. 随后在块132中将结果形成的扇区数据的无序序列调整到扇区数据的有序序列中，并且在块134中被存为有序序列136的范围。 Then at block 132 in the sector data formed as a result of an ordered sequence of random sequence is adjusted to the sector data, and is stored at block 134 in the range of an ordered sequence 136. 如果调整序列的初始运行没有有效地提炼（refine)扇区数据的全部序列的顺序，则将重复调整序列。 If the adjustment of the initial operation sequence is not effectively refined (Refine) sector data sequence of the entire sequence, the training sequence will be repeated. 图9示出了根据本发明一个实施例的AMS控制器的数据流和相关带宽分配。  FIG 9 illustrates a data flow in accordance with AMS distribution controller according to one embodiment of the present invention and a correlation bandwidth. 在该实施例中，AMS控制器138包含SRAM内部存储器接口140、DRAM DDR内部存储器接口142和闪存内部存储器接口144，以及RAM外部处理器接口146和DDR外部处理器接口148。 In this embodiment, the AMS 138 comprises an internal controller SRAM memory interface 140, DRAM DDR internal memory interface 142 and internal flash memory interface 144, a processor interface 146 and the external RAM external processor interface 148 and DDR. 这些组合的控制器接口140、142、144、146和148具有总的总线带宽，其明显大于外部计算设备的处理器总线接口（未示出）的带宽。 These combined controller interface 140,142, 144,146 and 148 have a total bus bandwidth, which is significantly larger than the external computing device processor bus interface (not shown) bandwidth. 该过量的总线数据传送能力允许AMS控制器138在存储设备之间直接传送高速缓存数据（DMA)并且同时允许外部计算设备的处理器分别从AMS存储器组件存取数据。 The excess of AMS bus data transfer capability allows cache data transfer controller 138 (DMA) directly between a storage device and a computing device external to the processor at the same time allowing access to data from the AMS are memory component. 该交叉存取的数据传送有利地允许AMS控制器138在增大的总数据传送速率下工作。 The interleaved data transfer advantageously allows AMS controller 138 operates at a total data transfer rate is increased. 用于每个AMS 存储器组件设备类型（SRAM 14、DRAM 16和闪存18)的实际总线可以根据每个执行的存储器组件的特定大小和容量特性而被配置为具有相同的基数（base)或者相同基数的倍数。  AMS memory component used for each type of device (SRAM 14, DRAM 16 and the flash memory 18) of the bus may actually be configured to have the same base (base) depending upon the particular characteristics of the memory capacity and the size of each component performed or multiples of the same base. 图9示出了当N = 4时在内部接口组件140、142和144的内部总线宽度和外部处理器接口组件146、148的外部总线宽度之间的4 ： I差值的实例，以及当L=4时用于SRAM的相同的总线配置，以及当M = 4时的闪存。 Figure 9 shows that when N = 4 when the internal interface between the components 140, 142 and 144 and the internal bus width of the external processor interface component 146, an external bus width of 4: Example I difference, and when L the same configuration for the SRAM bus, and when the flash memory when the M = 4 = 4. 当外部计算设备的处理器通过两个不同的内部数据总线BI和B2存取DRAM存储器时，能够利用AMS控制器138的过量的总线容量。  When a computing device external to the processor access to the DRAM memory through two different internal data bus BI and B2, the controller can be utilized AMS excess of the capacity of the bus 138. 该交叉存取的存取允许两个不同的内部DRAM数据总线BI、B2轮流地供应来自连续DRAM地址的高速缓存数据。 The interleaving access enable two different internal DRAM data bus BI, B2 alternately supplied from the cache data DRAM consecutive addresses. 该并行的DRAM数据传送允许DDR外部处理器总线在比内部总线上所需的更快的数据传送速率下工作。 The parallel data transfer permission DDR DRAM bus work external to the processor at a desired ratio of the faster internal bus data transfer rate. 与该存取同时，能够使用数据总线B3和B4在闪存18和包含在SRAM或DRAM存储设备14、16中的高速缓存之间发生DMA数据传送。 Simultaneously with the access, DMA data transfer data bus B3 and B4 occurs between the flash memory 18 and the cache contains the SRAM or DRAM memory devices 14, 16 can be used. 应当理解，由于在实际内部和外部总线实现之间的等待时间设定和周期时间上存在差异，因此实际总线带宽差值将不同于理论的4 ： I系数。  It should be appreciated that, since there is a difference, and to set the cycle time latency between the actual external and internal bus implementation, so the difference will be different from the actual bus bandwidth 4 Theory: I coefficients. 内部总线支持多总线传送协议，其可能不反映（reflect)外部处理器总线使用的相同的协议。 Internal bus supports multiple bus transfer protocol, which may not reflect the same protocol (the reflect) external to the processor using a bus. 例如，DDR外部处理器协议使用的版本和设定可能基本上不同于内部总线协议使用的那些。 For example, the external processor DDR version and set the protocol used may be substantially different from those used in the internal bus protocol. 一种增大将数据写入非易失性存储器（例如，闪存）或者从非易失性存储器读取数据的数据传送速率（通常按兆字节/秒计量）的方式是同时读取或写入数据到多个存储器组件。  An increase in the data written to the nonvolatile memory (e.g., flash memory) or data transfer rate of the data read from the nonvolatile memory (typically measured in megabytes / second metering) is a way to simultaneously read or writing data to a plurality of memory components. 利用该并行数据传送方案，能够使用多个不同的存储器组件尽可能有效率地传送大块的数据。 The use of parallel data transmission scheme, can use a plurality of memory components of different bulk data transfer as efficiently as possible. 能够使计算设备的操作系统容易具有尽可能小的读写数据单元大小将是有利的。  a computing device operating system can be made easily with the smallest possible size of the write data unit would be advantageous. 利用较小的最小单元大小（即，数据扇区）避免了在从存储器读取较小片信息或将较小片信息写到存储器时（例如，在用许多小片信息编码文件目录信息时）不必要地浪费存储器存储空间。 Using a smaller size of the minimum unit (i.e., data sector) is avoided when reading information from the memory smaller pieces or small pieces of information written to the memory (e.g., when many small pieces of content information with encoded information file) is not unnecessarily wasting memory storage space. 此外，利用较小单元的数据还避免了可能用坏给定记录介质的不必要的写入操作。 In addition, the use of smaller data units may also avoids the recording medium by the given bad unnecessary writing operation. 不幸的是，实现更快的数据传送速率和更小的扇区大小这两个目标通常是矛盾的。  Unfortunately, the faster data transfer rate and a smaller sector size of these two objectives often contradictory. 期望一种增大数据传送速率而同时维持更小单元的数据大小的装置。 Desirable method of increasing a data transfer rate and data size of the device smaller while maintaining unit. 另外，期望用最小的功率损耗和在MCP组件之间的最小所需互连来实现该装置。 Further, it is desirable with a minimum power loss and minimum required interconnections between the MCP assembly of the apparatus is achieved. 如图9所示，AMS控制器138包括多个非易失性组件接口144(例如，闪存接口）。  As shown in FIG. 9, the AMS controller 138 comprises a plurality of non-volatile components of interface 144 (e.g., a flash memory interface). 这些多个接口便于同时从多个非易失性组件读取和写入到多个非易失性组件，由此增大到单个非易失性设备的多个组件的读取和写入数据传送速率。 The plurality of interfaces to facilitate simultaneous read and write from a plurality of non-volatile components of the plurality of non-volatile components, thereby increasing read and write data to a plurality of non-volatile components of a single device transfer rate. 不幸的是，在存储更小块的数据时这引入了固有的缺点。 Unfortunately, when the data stored smaller pieces which introduces inherent disadvantages. 为了克服该缺点，本发明的独立的非易失性闪存接口144包括在单个读取或写入操作期间启用（enable)独立闪存组件中的每一个的功能部件。 To overcome this drawback, a separate nonvolatile flash memory interface 144 or the present invention includes reading feature enabled (enable) independent of each flash memory device during a single write operation. 能够实现达到启用或禁用（disable)组件的该目标的多个技术。 Enabling reaching enable or disable (disable) the technical components of multiple targets. 第一种技术是为每个非易失性组件使用独立的启用信号。 The first technique is to use a separate component for each non-volatile enable signal. 该技术具有通过在给定的读取或写入操作期间禁用不用的设备来使功率损耗最小化的优点。 This technique has during a given read or write operation without disabling the device to minimize power losses of advantages. 第二种技术是修改在给定的写入操作期间使用的地址。 A second technique is to modify the address used during a given write operation. 如本领域中众所周知的，非易失性存储设备（例如闪存）具有某些已知是有缺陷的且因此不能用于存储信息的地址位置。  As is well known in the art, a non-volatile memory devices (e.g., flash memory) having a certain known are defective and therefore can not address locations for storing information. 对于第二种技术，将不希望被写入的独立组件的地址位置设置为已知有缺陷的位置。 For the second technique, the individual components do not want to address locations to be written is set to a position known to be defective. 过量的写入操作不会破坏有效的存储信息，因为该地址位置已经被标记为有缺陷的，并且决不会从该位置检索信息。 Excess valid write operation does not destroy the stored information, because the address location has been marked as defective, and will never retrieve the information from that location. 这还不需要附加的到组件的连接，因为对于正常操作已经要求地址信息被呈现于组件。 This does not need to connect additional components, for normal operation as address information has been presented to the assembly requirements. 因此在控制器和非易失性存储器组件之间没有连接的附加成本的情况下达到写入组件的子集的目标。 Thus in the case of additional costs between the controller and the nonvolatile memory component does not reach the target connected subset of the writing unit. 如图I中所示出的，在本发明的一个实施例中，AMS MC P集成电路被设计成包括要与附加的DRAM和闪速存储器组件耦接的扩展闪存总线26和扩展DRAM总线24。  As illustrated in Fig I, in one embodiment of the present invention, AMS MC P integrated circuit is to be designed to include additional components of a DRAM and a flash memory coupled to expansion bus 26 and the flash expansion DRAM bus 24. 如本领域技术人员会理解的，附加的DRAM和闪速存储器组件应该被配置为和已有的驱动器软件一起运行，该已有的驱动器软件存在于已有的AMS文件系统分区50内的嵌入式SRAM/DRAM/闪存可安装文件系统54中（参见图3)。 As those skilled in the art will appreciate, additional DRAM and flash memory components and should be configured to run existing software drivers with the existing software drivers embedded within 50 present in the existing file system partitions AMS SRAM / DRAM / Flash installable file system 54 (see FIG. 3). 另外，增加的DRAM或闪速存储器组件将需要更新已有的AMS存储器组件驱动器，使得能够在安装时避免不可预知的错误。 Further, a DRAM or flash memory to increase the component will need to update the existing AMS memory component driver, making it possible to avoid the unpredictable errors during installation. 此外，在本发明的一个实施例中，AMS MCP集成电路被设计成包括扩展总线接口28 (在图I中示出），由此控制器能够通过扩展总线与次级（secondary)计算设备通信。  Further, in one embodiment of the present invention, AMS MCP integrated circuit is designed to include an expansion bus interface 28 (shown in FIG. I), can be calculated by the controller whereby the secondary expansion bus (Secondary) communications equipment. 仅仅为了方便和清楚起见，该扩展总线接口28被示出为与扩展DRAM总线24和扩展闪存总线26无关，然而，应当认识到能够可配置地将扩展总线接口28并入扩展DRAM总线24或者扩展闪存总线26中，以减少AMS控制器管脚数。 Merely for convenience and clarity, the expansion bus interface 28 is shown with extended bus 24 and the DRAM 26 is independent of the flash expansion bus, however, it should be appreciated that the configuration may be possible to extend the extended bus interface 28 incorporated in the DRAM bus 24 or the extension flash bus 26 in order to reduce pin count controller AMS. 扩展总线接口28有效地允许AMS控制器同时通信和传送所存储的数据到多个外部计算设备。 Expansion bus interface controller 28 effectively allows AMS simultaneous communications and transmit the stored data to a plurality of external computing device. 如上所述，还应当理解，本实施例的SRAM 14、DRAM 16和闪存18存储器组件（在图I中示出)仅仅是能够在AMS内运行的存储器类型的实例，而本发明不限于本实施例中使用的精确的存储器类型。  As described above, it should be appreciated that, SRAM 14, DRAM 16 and a flash memory component 18 of the present embodiment (shown in FIG I) are merely examples of the type of memory capable of operating in the AMS, the present invention is not limited to the exact type of memory used in the embodiment. 存在提供与上述存储器类型类似的特征和功能的可替代技术。 Connected to said memory exists to provide features and functions similar to the type of alternative technologies. 例如：SRAM 14的实现能够用一种伪SRAM (PSRAM)替换；DRAM16的实现能够用一种零电容器RAM(ZRAM)或者双晶体管RAM (TTRAM)替换；并且闪存18的实现能够被具体地指定为与非（NAND)或者或非（NOR)型闪存，或者能够用一种相变存储器（PCM、PRAM)来替换。 For example: to achieve the SRAM 14 can be replaced in a pseudo SRAM (PSRAM); DRAM16 to achieve a zero-capacitor can be replaced with RAM (ZRAM) or two-transistor RAM (TTRAM); and a flash memory 18 can be implemented specifically designated as NAND (the NAND) or NOR (NOR) flash memory, or can be a phase change memory (PCM, PRAM) is replaced with one. 显而易见，上面列出的可替代的存储器组件类型不是穷举的，并且可以进行许多其它改变，而同时还允许本发明如上所述的工作。 Clearly, an alternative type of memory components listed above are not exhaustive, and that many other changes may be made, while still allowing operation of the present invention as described above. 1. ー种包括在用于改进外部计算设备的性能的自适应存储设备中的单个控制器，其中所述自适应存储设备还包括： 第一类型的存储器； 第二类型的存储器； 第三类型的存储器； 内部总线系统；以及外部总线接ロ； 其中所述单个控制器经由所述内部总线系统通信地耦接到所述第一类型的存储器、所述第二类型的存储器和所述第三类型的存储器； 其中所述单个控制器经由所述外部总线接ロ通信地耦接到外部计算设备； 并且其中所述单个控制器包括： 用于使用所述内部总线系统与所述第一类型的存储器、所述第二类型的存储器和所述第三类型的存储器通信的装置； 用于经由所述外部总线接ロ作为单个存储设备而与所述外部计算设备通信的装置；用于将高速缓存数据存储指派分配到所述第一类型的存储器内的存储空间，并且在所述第一类型的存储器 1. ー species comprises a single controller for improving the performance of an adaptive external computing device storage device, wherein said adaptive storage device further comprises: a first type of memory; a second type of memory; third type a memory; internal bus system; ro and an external bus interface; wherein the single controller is coupled to the first type of system memory via said internal communications bus, said second and said third type of memory types of memory; wherein the single controller is connected to an external computing device via the external bus interface communicatively coupled ro; and wherein the single controller comprising: means for using the internal bus system of the first type memory, the second type of memory device and a memory in communication with the third type; ro for receiving as a single storage device and said external computing device communicating with the external apparatus via the bus; means for caching assigning data storage space within the storage allocated to the first type of memory, and the memory of the first type 的所述存储空间被确定为满的之后，将高速缓存数据存储指派分配到所述第二类型的存储器内的存储空间的装置；以及用于将高速缓存数据从所述第一类型的存储器或者所述第三类型的存储器传送到所述第二类型的存储器的装置； 其中如果所述高速缓存数据存在于所述第一类型的存储器内，则将所述高速缓存数据从所述第一类型的存储器传送到所述第二类型的存储器；并且其中如果所述高速缓存数据不存在于所述第一类型的存储器内，而存在于所述第三类型的存储器内，则将所述高速缓存数据从所述第三类型的存储器传送到所述第二类型的存储器。 The storage space is determined after a full, means storage space in the second type of memory allocated to the cache data memory is assigned; and means for caching data from the first memory type or the third type of memory to the memory device of the second type; wherein if the cache data present in the memory of the first type, then the cache data from the first type memory to said second memory type; and wherein if the cache data is not present in the memory of the first type, while the third type is present in the memory, then the cache transferring data from said third memory to said second type of type of memory. 2.根据权利要求I的单个控制器，其中所述第一类型的存储器是静态随机存取存储器SRAM,所述第二类型的存储器是动态随机存取存储器DRAM，并且所述第三类型的存储器是闪速存储器。 The single controller as claimed in claim I, wherein said first type of memory is a static random access memory SRAM, the second type of memory is a DRAM dynamic random access memory, and the third type of memory a flash memory. 3.根据权利要求I的单个控制器，其中所述第一类型的存储器和所述第二类型的存储器是不同的易失性类型的存储器，而所述第三类型的存储器是非易失性类型的存储器；并且其中所述单个控制器还包括： 用于使所述第一类型的存储器和所述第二类型的存储器的部分掉电以使功耗最小化的装置。 The single controller as claimed in claim I, wherein the first type of memory and the second memory is a type different from the type of volatile memory, and the third type of memory is nonvolatile type a memory; and wherein the single controller further comprising: a power-down portion of the first memory and the second type of type of memory to minimize power consumption of the apparatus. 4.根据权利要求2的单个控制器，其中所述单个控制器还包括： 用于根据数据先行方案将来自所述闪速存储器的数据高速缓存到所述SRAM和DRAM的装置。 A single controller according to claim 2, wherein the single controller further comprises: a first embodiment according to the data from the flash memory data cache to the SRAM and DRAM devices. 5.根据权利要求I的单个控制器，其中所述第一类型的存储器和所述第二类型的存储器是不同的易失性类型的存储器，而所述第三类型的存储器是非易失性类型的存储器；并且其中所述单个控制器还包括：至少ー个扩展存储器总线，用其与外部存储器通信以扩展可用存储器的容量。 The single controller as claimed in claim I, wherein the first type of memory and the second memory is a type different from the type of volatile memory, and the third type of memory is nonvolatile type a memory; and further wherein the single controller comprising: a memory bus expansion ー least, with which an external memory in communication with the capacity to expand the available memory. 6.根据权利要求I的单个控制器，其中所述第一类型的存储器和所述第二类型的存储器是不同的易失性类型的存储器，而所述第三类型的存储器是非易失性类型的存储器；并且其中所述单个控制器还包括： 至少ー个扩展存储器接ロ，用其与次级外部计算设备通信。 The single controller as claimed in claim I, wherein the first type of memory and the second memory is a type different from the type of volatile memory, and the third type of memory is nonvolatile type a memory; and wherein the single controller further comprising: at least ー ro expansion memory interface, with a communication device which calculates the external secondary. 7.根据权利要求I的单个控制器，其中所述第一类型的存储器和所述第二类型的存储器是不同的易失性类型的存储器，而所述第三类型的存储器是包含多个组件的非易失性类型的存储器；并且其中所述单个控制器还包括： 用于选择性地启用所述多个组件中的ー个或多个的装置；以及用于选择性地禁用所述多个组件中的ー个或多个的装置。 The single controller as claimed in claim I, wherein the first type of memory and the second memory is a type different from the type of volatile memory and the third memory is a type comprising a plurality of components type nonvolatile memory; wherein the single controller and further comprising: means for said plurality of components or a plurality ー for selectively enabling; and means for selectively disabling the plurality means components of one or more of ー. 8.根据权利要求7的单个控制器，其中所述单个控制器还包括：用于通过将启用信号发送给那些要被启用的组件来选择性地启用所述多个组件中的ー个或多个的装置。 A single controller according to claim 7, wherein the single controller further comprising: means for selectively enabling the plurality of components of one or ー those components to be activated by the enable signal is transmitted to the th device. 9.根据权利要求7的单个控制器，其中所述单个控制器还包括：用于通过将要被禁用的那些组件的地址位置设置为已知的有缺陷的地址位置来选择性地禁用所述多个组件中的ー个或多个的装置。 A single controller according to claim 7, wherein the single controller further comprising: means for setting the address location of those components will be disabled for the defective address location known to selectively disable said plurality means components of one or more of ー. 10. 一种用于由自适应存储设备中包括的单个控制器控制该自适应存储设备的方法，其中所述自适应存储设备还包括第一类型的存储器、第二类型的存储器、第三类型的存储器、内部总线系统以及外部总线接ロ，其中所述内部总线系统将所述单个控制器耦接到所述第一类型的存储器、所述第二类型的存储器和所述第三类型的存储器，所述外部总线接ロ将所述单个控制器耦接到外部计算设备，所述方法包含以下步骤： 使用所述内部总线系统与所述第一类型的存储器、所述第二类型的存储器和所述第三类型的存储器通信； 经由所述外部总线接ロ作为单个存储设备而与外部计算设备通信； 将高速缓存数据存储指派分配到所述第一类型的存储器内的存储空间，并且在所述第一类型的存储器内的所述存储空间被确定为满的之后，在所述第二类型的存储器的存 10. A method for the adaptive storage device controlled by a single storage device comprises an adaptive control, wherein said apparatus further comprises a first adaptive storage type memory, a second memory type, third type a memory, an internal bus and an external system bus interface ro, wherein the internal bus system of the single controller coupled to the first memory type, memory of the second type and the third type of memory said external bus interface ro the single controller coupled to an external computing device, the method comprising the steps of: using the internal bus system of the first type of memory, and the second type of memory the third type of memory communication; ro via the external bus interface communication as a single computing device with external storage devices; cache data stored in the allocated memory space assigned to the memory of the first type, and the after the storage space in said first type of memory is determined to be full, the second type stored in memory 储空间内分配高速缓存数据存储指派；以及将高速缓存数据从所述第一类型的存储器或者所述第三类型的存储器传送到所述第ニ类型的存储器； 其中如果所述高速缓存数据存在于所述第一类型的存储器内，则将所述高速缓存数据从所述第一类型的存储器传送到所述第二类型的存储器；并且其中如果所述高速缓存数据不存在于所述第一类型的存储器内，而存在于所述第三类型的存储器内，则将所述高速缓存数据从所述第三类型的存储器传送到所述第二类型的存储器。 Allocating the memory space assigned to the cache data storage; and transmitting the data from the cache memory type or the third type of the first memory to said second memory type Ni; wherein if the data exists in the cache said first type of memory, then the data transfer from the cache memory of the first type to the second type of memory; and wherein if the cache data is not present in the first type in the memory, present in a memory within the third type, then data transfer from the cache memory of the third type to the second type memory. 11.根据权利要求10的方法，其中所述第一类型的存储器是静态随机存取存储器SRAM,所述第二类型的存储器是动态随机存取存储器DRAM，并且所述第三类型的存储器是闪速存储器。 11. The method according to claim 10, wherein said first type of memory is a static random access memory SRAM, the second type of memory is a DRAM dynamic random access memory, and the third type of memory is flash memory speed. 12.根据权利要求10的方法，其中所述第一类型的存储器和所述第二类型的存储器是不同的易失性类型的存储器，而所述第三类型的存储器是非易失性类型的存储器，并且其中所述方法还包含以下步骤：使所述第一类型的存储器和所述第二类型的存储器的没有被写入的部分掉电，以使功耗最小化。 12. The method according to claim 10, wherein said first and said second type of memory are different types of memory volatile type of memory, and the third type of memory is a nonvolatile memory type and wherein said method further comprises the step of: the portion is not written in memory of the first type and the second type of memory power-down, to minimize power consumption.